The Panasonic DMC-GF2 has officially been unveiled – with the Micros Four Thirds digital camera claiming to be the world's smallest and lightest digital interchangeable lens compact system. Panasonic's DMC-GF1 has been both a commercial and critical hit for the company, and the follow up will be aiming to follow its success. The GF2 is 'dramatically' downsized from its predecessor – 19 per cent smaller and 7 per cent lighted and also features a new built-in flash which pops up to avoid any 'vignetting' effect by being too close to the lens. 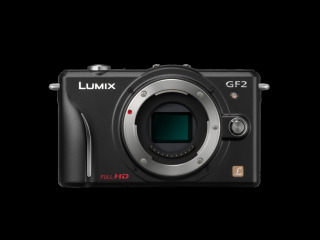 The Panasonic DMC-GF2 features a 12.1MP high speed Live MOS sensor and can take video footage in full HD 1920x1080 in AVCHD. "The operation is extremely easy to understand for any level of users with the adoption of touch control and the new Graphic User Interface (GUI) designed especially for DMC-GF2, adds Panasonic. "The focus is immediately set to the subject by just touching it on the large, 460,000-dot LCD and you can even release the shutter." The camera has a UK release date in January – with three kit options - and is available in black silver or red. We are still trying to ascertain the UK price.